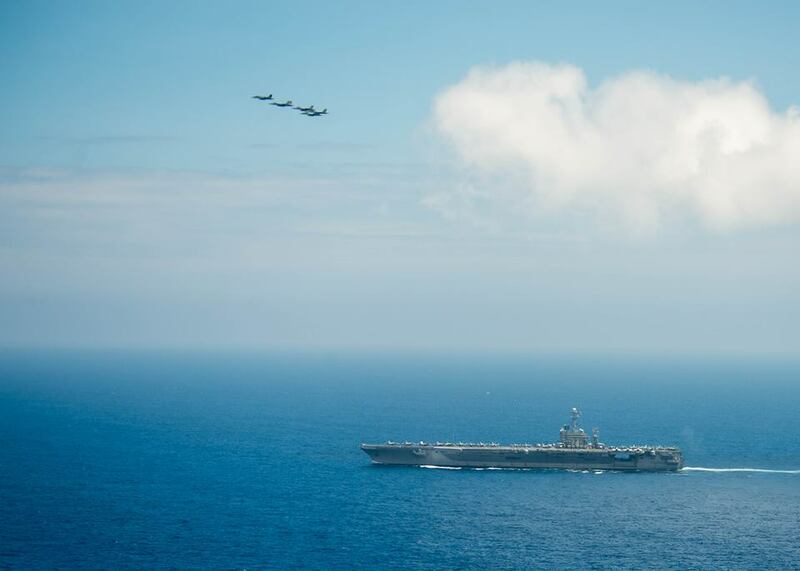 PHILIPPINE SEA, -- Units from the Navy's Carrier Air Wing (CVW) 5, Destroyer Squadron (DESRON) 15, Commander Task Force (CTF) 70, and the Air Force's 18th Wing participated in a joint air defense exercise, June 20. The hypothetical scenario helped improve interoperability between the Navy and Air Force. The evolution was created to defend a damaged unit from potential threats and further damage. "The aircrew was focused on working together for this event," said Capt. John Enfield, commanding officer of CVW 5. "We were able to strengthen our interoperability with the Air Force and continue to refine procedures for joint operations in the Western Pacific." The event was focused on establishing communications and exchanging tactical data with the participating aircraft and ships. The ships and aircraft were required to meet certain communication standards in order to continue sharing information throughout the evolution. "Chancellorsville acted as the CTF 70 Air Defense commander for this event," said Capt. Curt Renshaw, commanding officer of guided-missile cruiser USS Chancellorsville (CG 62). "It was our job to ensure all incoming threats were engaged by the aircraft and handled so that there was no chance of further engagement." Renshaw said the Navy units conduct various air defense-focused trainings, but conducting this joint training exercise in a real-world environment gave the units a different perspective on how to work together. "These exercises allow us to learn to work together as a team," said Lt. David Ash, a pilot from Strike Fighter Squadron (VFA) 115. "Through joint exercises, we are able to standardize the way we fight in order operate more effectively as a combined force." Throughout the exercise, each unit was responsible for its own part of the larger joint effort, strengthening the interoperability and experience between military units. The continued joint evolutions build the ties between the different military branches to improve their ability to support security and stability in the Indo-Asia-Pacific. 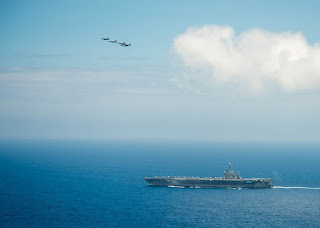 A combined formation of aircraft from Carrier Air Wing (CVW) 5 and Carrier Air Wing (CVW) 9 pass in formation above the Nimitz-class aircraft carriers USS Ronald Reagan (CVN 76) and USS John C. Stennis (CVN 74).